Seats are filling up fast as others got their tickets early. You know what you need to do….. Simply fill in some basic info in the form under the Admit One Image. Once you submit, you will find the final check out page for your 3 Day Event Access. Remember to reserve your hotel room too! Step 1: Read all the Benefits You Get! YES! GET CONFERENCE & V.I.P. TICKETS HERE! To attend the 3rd Annual "Dare to be D.I.N.O!" Business Leadership Conference, fill out the info below. General Access All inclusive three day Conference Tickets are only $597 until 6-1-19. $750 from 6-1-19 through Oct 24th, 2019. 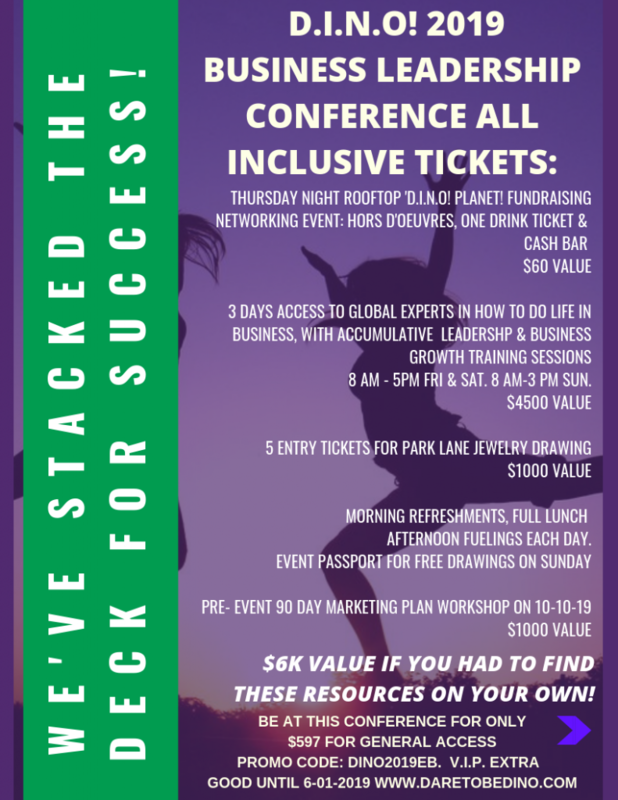 This gives you access to all the speakers, training, food, Thursday Night Networking Under the Stars Fundraiser Event, giveaways and more! Want to go V.I.P. for conference seating and be part of the "Money Matters V.I.P. Dinner Friday Night? This access pass includes all the General Access Provisions Plus the V.I.P. benefts. Check out with the V.I.P. tickets for only $997 full immersion info training to help you scale up successfully. Thursday Night Networking Under the Stars Rooftop Fundraising Event Only tickets on sale now for $35 pre-registered. $40 at the door. Get your tickets by Oct 1st and Be Part of the LIVE Virtual "Jump Start 90 Day Marketing Plan Workshop 2019 - a $1k Value for FREE and create your new marketing plan after this conference! When you enter your info, final ticketing details will open up for you. Note: these are conference tickets only. Be sure to reserve your hotel and lodging directly with the Hotel. Conference rates for rooms good through 10 1-19. Stay right onsite at the Springhill Suites Hotel. Early bird Hotel Event pricing good through 10/1/19. Rooms come with 2 Queen beds or 1 King, include breakfast and can sleep up to 6-8 people. Stay in sophisticated suites with unbeatable views of the Pacific Ocean & bustling downtown Oceanside & enjoy a complimentary breakfast buffet daily. 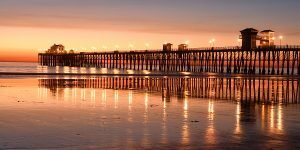 Visit loved ones at Camp Pendleton, walk down the Oceanside Pier, or join the adventures at LEGOLAND, SeaWorld & other San Diego County attractions. Fitness room, roof top pool available to guests. We have to say this stuff legally and it’s important to know. We’ve taken every effort to ensure we accurately represent this conference and it’s potential to help you. However, we do not purport this as a “get rich scheme” and by law we cannot guarantee that you will achieve any results or earn any money from attending this seminar. Your level of success in attaining results is dependent upon a number of factors including your skill, knowledge, ability, dedication, business savvy, business focus, business goals, partners, promotions, audience, and financial situation. Because these factors differ according to individuals, we cannot guarantee your success, income level, results, or ability to earn revenue. You alone are responsible for your actions and results in life and business. This seminar is for educational use only and we make no representation or warranties with respect to the accuracy, applicability, or completeness of its contents. Any forward-looking statements outlined in our promotions are simply our opinions, estimates, expectations or forecasts for future potential, and thus are not guarantees or promises for actual performance. As required by law, we can make no guarantees that you will achieve any results from our ideas or models presented during the seminar and we do not offer professional, legal or financial advice. Our only guarantee is that you’ll be satisfied with the quality of the conference. If you are not satisfied you can have a full refund. Under no circumstances will the creators of or experts represented in this program be held liable to any party for any direct, indirect, punitive, special, incidental or other consequential damages arising directly or indirectly from any use of this material. We are not responsible for your actions or the information or actions of any third party that may be part of the contents or promotions of this program. By enrolling and participating in this seminar you agree to these statements and agree not to hold our company liable for your results or actions. You also agree to let us know if you are unhappy with the conference so that we can address your concerns or refund your ticket access. FEE INCLUDES: A notebook and lunch for each registered person and admittance to the conference. By attendance each attendee grants permission to be audiotaped, video-taped, and/or photographed by any means and grants your full likeness, voice, and/or words to be used by TRC/DS Brands. ATTIRE: Business casual is appropriate. TAPING: No audiotaping or videotaping of the full sessions is allowed. NEWSLETTERS: Registrants will also begin receiving exclusive content, offers, and product information from the TRC/DS Brands via our e-newsletters. You may unsubscribe from these newsletters at any time by following the link provided at the bottom of each email. We will not share your email address with anyone. ALL RIGHTS RESERVED: TRC/DS Brands reserves the right to substitute speakers and/or times due to circumstances beyond our control. Entry pass is a revocable license and may be taken and admission refused at the sole discretion of TRC/DS Brands. LIABILITY: Each attendee assumes all risks incidental to the event/conference and TRC/DS Brands shall not be liable for bodily injury, property damage, theft or losses suffered or incurred by the attendee while attending the event/conference. CANCELLATIONS: There are no refunds or credits on account if you are unable to attend this event. Tickets are completely transferable, however – in the event you are unable to attend, you may transfer your ticket to a third party. Notification to TRC/DS Brands. of ticket transfer is not necessary. If invoiced, full payment is due within 30 days. If no payment is received within 30 days a new invoice will be issued at the current full pricing. All deposits are non refundable. © 2019 TRC/DS Brands. All trademarks shown are the property of their respective owners.